Khiva, once a major city of ancient Khorezm (also spelled Khwarezmia, Khwarizm, Khwarazm, Khwarezm, Khoresm, Khorasam, Harezm, Horezm, and Chorezm) features an almost intact medieval Central Asian historic city being preserved as it was in the past - Ichan-Kala (‘inner city’). Although protected by the state and having the status of a museum reserve, Ichan-Kala is populated with real people, mainly artisans. You can occasionally smell frying meat and onion there, for instance, or see children running about. It is real pleasure to stroll along its cobbled streets, visiting Juma Mosque with its 112 wooden pillars covered with beautiful carvings, Kunya-Ark Fortress with its most interesting exhibits, or Islam Khodja Minaret where you can climb narrow spiral stairs to have a terrific Ichan-Kala panoramic view. 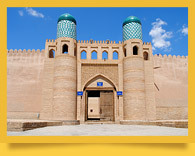 The historical complex Ichan-Kala (‘inner defense circle’) is an almost intact medieval old town area in Khiva. 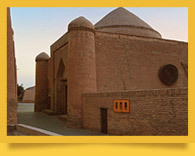 It was the first site in Central Asia to be included in UNESCO World Heritage List. In 1969 Ichan-Kala was designated a historical and architectural conservation area. Ichan-Kala is a densely built-up old town. It has several times been destroyed and restored. They date the beginning of its construction to 1598. It was in this year when because of a change of Amudarya River course the capital of Khorezm was transferred from Gurgandj (Urgench) to Khiva. 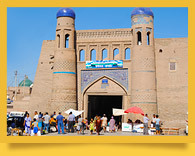 Kunya-Ark ‘old fortress’ was Khiva rulers’ residence and citadel. Every city in Central Asia had a similar fortified structure before the 20th century. The fortress had a developed infrastructure, in modern terms; it had anything for convenient living, administration, and entertainment of the khan, his family, officials and troops. Since the end of the 18th century the fortress had been a guarded “town in the town”; it was hidden behind its own castellated adobe wall, not to mention the 10-meter-high and 5-6-meter-thick fortification wall of Ichan-Kala itself. Pakhlavan Mahmud from Khorezm was a real person who became a legend. He earned his living as a furrier and was a talented poet, philosopher and wrestler by vocation. 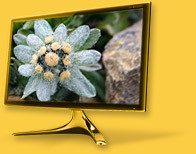 He became famous for his gifts in Khiva and far outside it during his life. They say he always defeated those who wrestled with him except one man because he had learned that this man would be executed if Pakhlavan Mahmud won. Professional Iranian wrestlers still pray to the great Pakhlavan Mahmud before every fight today. According to the legend, Pakhlavan Mahmud died in 1322 or 1325 and was buried in his workshop. 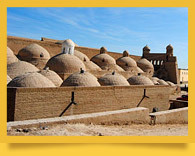 Islam-Khodja Complex is one of the pearls of Ichan-Kala - Khiva’s historical part, which was the first Uzbekistan’s site included in the UNESCO World Heritage List in 1990. Although the madrasah and minaret of the complex were built only in 1908 - 1910, they are the most prominent of Ichan-Kala, its landmark. The complex is famous thanks to the contrast between its Ichan-Kala’s tallest minaret and smallest madrasah, as the architect of the complex designed. Thus the minaret, visible at a long distance, looks even grander. Located in the eastern part of Ichan-Kala, Tash-Khauli Palace built in 1830 - 1838 is an example of Khorezm architectural grandeur of those times. The palace was built by order of Allakuli-Khan. All the parts of Tash-Khauli are connected with a labyrinth of dim corridors. The khan’s chambers and harem are separated from the official part by a single corridor. The khan’s room is the largest and richest in decoration; the other four rooms were used by the khan’s wives - according to the Koran, a man must not have over four wives. 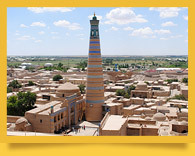 Of all Khiva mosques the Friday-prayer Juma Mosque located in the center of Ichan-Kala takes the most prominent place. Its main distinctive feature is its architectural design, which is uncharacteristic of mosques. Despite the tradition Juma Mosque has no arched entrances, portals or even domes. It is just a one-storey structure with strong walls and three doors. Such inconsistency was due to the fact that the mosque was constructed - thanks to the khan’s nobleman Abdurahman Mihtar’s benefaction in the late 18th с - on the site of an older mosque dating back to the 10th c, and so they decided to build the new mosque to be just the same as the previous one had been. Located in the western part of Ichan-Kala, Muhammad Amin-Khan Madrasah built in 1845 - 1855 still impresses us with its splendor. It is the largest Central Asian madrasah. The Arabic inscription above its entrance says ‘This beautiful building will stand to please the descendants forever’. The five domes and corner towers complement the splendor of the structure. The building is richly decorated with glazed bricks and traditional majolica; all the doors bear ornamental carvings. Allakuli-Khan Madrasah, located between Ichan-Kala eastern gate and the roofed bazaar Tim, was one of Khiva largest religious schools in the past. 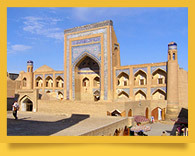 The construction of the madrasah in 1834 - 1835 was funded by the khan Allakuli who ruled in Khiva then. 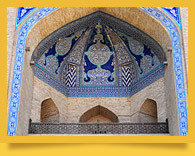 The building is justly considered one of the best examples of Khorezm medieval architecture. The madrasah shows perfect harmony of tradition, proportion and magnitude. 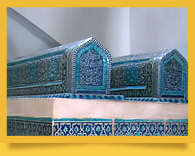 The portal and arched niches are simply and yet elegantly decorated with blue and black-and-while Khorezm-style majolica. Built in 1832 - 1833 in the reign of Allakuli-Khan, this caravanserai resembles a madrasah. Only its main gateway differs from a madrasah’s - it leads to the yard directly. There are two stories of hudjra cells around the yard: the first was used for storing things, the second for stays in.The first floor of the madrasah housed the town’s library in the 19th c. It was very popular with the students of Khiva madrasahs. Today Allakuli-Khan Madrasah houses. The Abu Ali ibn Sino Medical History Museum. 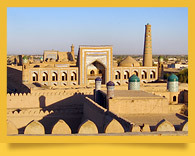 Muhammad Rakhim-Khan Madrasah is one of the most well-known and largest Khiva madrasahs. 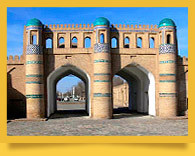 It was built in 1876 in front of Kunya-Ark Fortress by order of Muhammad Rakhim-Khan. Since Muhammad Rakhim-Khan was a patron of scholars, the madrasah had classrooms and a rich library. There were also summer and winter mosques. The 70 cells to enter from the yard boasted heating and cooking equipment and utility compartments in addition to living area in them. There are a lot of Khiva origin legends. According to one of them, the city was founded by Shem, the biblical Noah’s son. It says that after the Deluge Shem wandered about the desert, lay down to rest and dreamt about seeing 300 blazing torches. He believed it had been an omen and built a city in the form of a ship - as to the arrangement of the torches in the dream. 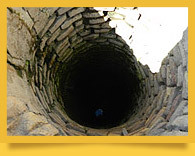 Then Shem dug a well called Kheyvak, which was what the name of the city originated from. 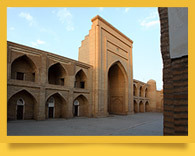 Shergazi-Khan Madrasah is one of the oldest Khiva madrasahs. It is located in the center of Ichan-Kala, right before the entrance to Pakhlavan Mahmud Masouleum. Owing to the natural subsidence of the earth under the building, its entrance went two meters down over time. The construction of the madrasah was launched in 1718 by order of Shergazi-Khan by his prisoners of war he had captured during his successful military campaign in Khorasan. The madrasah is a one-storey building with a two-storey portal. The yard inside the building has four ayvan porticoes along its sides. The square Palvan-Darvoza (‘great gate’) at the eastern Ichan-Kala gate is, perhaps, the busiest Khiva place. Palvan-Darvoza Gate was built in 1804 - 1806 and has the shape of an arched portal with an inscription above the entrance. It says Shakhri Khiva (‘the city of Khiva’) and shows 1806 - the year they completed the construction of the gate. After the entrance arch there is a vaulted trade gallery with merchants’ shops on either side. At the exit from Ichan-Kala and to the right of Palvan Darvoza Gate there had been a slave market till 1873. 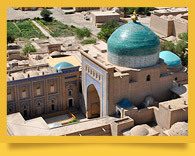 Sayyid Alauddin Mausoleum is one of the oldest Khiva’s architectural monuments in its Ichan-Kala inner town. The mausoleum has been many times reconstructed and modified; scholars can only presume its original appearance and the date of construction. It is only known that the sheikh Sayyid Alauddin himself - a well-known Sufi of Nakhshbandiyya Sufi order - died in 1303, as the inscription on the tomb says. However, the construction of the mausoleum is dated to the times of Amir Kulyal - the second half of the 14th c.
Dishan-Kala fortification wall was built at the instigation of Allakuli-Khan’s in the mid-19th с so as to protect the city from attacks of Turkmen tribes. The khan issued a decree requiring that each of his subjects work at the construction site of the wall for 12 days a year - for free, of course. Since the khan had over 200,000 men, the wall was built quite quickly - in 3 years’ time. Its length was 6,000 meters; it was 8 meters tall and 6 meters thick. Unfortunately, Dishan-Kala has survived into the present much less than Ichan-Kala. 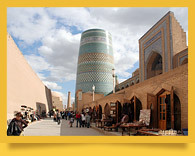 Neighborhood mosques in Khiva’s mahalla or guzar residential communities were common in the city. Aq Mosque, meaning ‘a white mosque’ in Uzbek, is a classical example of such a structure. 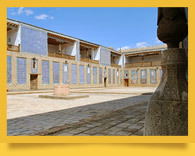 As a part of an architectural ensemble, it is located near Ichan-Kala eastern gates in Khiva. 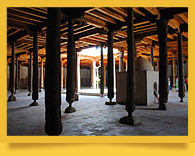 The foundations of the mosque were laid near Anush-Khan Baths in 1657. However, the construction of the building was suspended till the mid-19th c, which the door inscriptions say. The doors also bear decorative and epigraphic carvings with the names of Khiva’s master wood carvers: Nur Muhammad, the son of Kalandar, and Kalandar, the son of Seyd Muhammad. 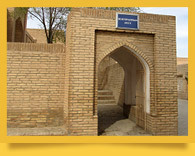 Anush-Khan Bathhouse is located near Ak-Mosque; they laid its foundations in 1664. It is still surprising how sophisticated were its heating, water supply systems and sewerage. The bathhouse was used as vakf - property the profit from which was used for charity - of Ak-Mosque. The medieval Oriental bathhouse had an entrance hall, change rooms and washing rooms. Ahush-Khan Bathhouse had this layout as well. It had a heating system under the floor and semi-basement compartments to keep warmth for a long time. 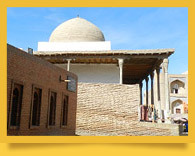 The Avesta Museum is situated in Khiva, in one of its numerous madrasahs. According to some scientists, Avesta, the sacred book of Zoroastrianism, originated in Ancient Khorezm (also spelled Khwarezmia, Khwarizm, Khwarazm, Khwarezm, Khoresm, Khorasam, Harezm, Horezm, and Chorezm), which was the reason why the Avesta Museum was organised in Khiva, the capital of this ancient state. 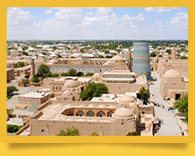 Khiva is mentioned in the Zoroastrian sacred book under the names of ‘Urva’ and ‘Urga’.